New Years Day. All the same. Resolutions were to work very, very hard on all aspects of life. Do your best and leave the rest. Do everything smartly and wisely. Never lose temper and never, never give up. Do right thing always. Think always before leaping. Never work on instincts. Work fast, fast. Always be self-confident and do what you want and do it nicely and wisely. Don’t think of awards and rewards. First day of college in new year. I had worn pants to college and it looked smart. Meeta Ben’s birthday and Meena Ben had to see a boy at Avanti. I went with Mummy and daddy to Matunga. The boy was OK. He was America returned and spoke with manners. Then in the afternoon we went to do shopping to all Matunga’s best shops. Charu Ben gave Meeta Ben a shirt. Then in the evening we went to woodlands and then back home. I went to college wearing Jeans and Manisha’s white shirt. It looked good. I felt damn good and smart. In the recess I went with Christine to Andheri station and came by train afterwards.. I had bad coughing problem in the train afterwards in train. It was embarrassing. Full day watching tv. I had my periods today. First we watched saptahiki, then star trek, show theme,Mashoor Mahal, then regional film ‘Bhavni Bhavai’. It was fun. I finished my book ‘Passion’s Promise’ today and now I want to study very hard to get nice marks for board exams. I didn’t go to college for studying. Bhavna had come in the afternoon but we hardly studied anything. The boy we saw for Meena Ben on 4th asked for second meeting. Meena Ben doesn’t like him so much. But all are saying that family is good and Meena Ben cried very much at night. I went to college wearing new churidar for Kajal’s. It looked good. But I felt very bored at college. At BK and OC stomach was paining. I felt very uncomfortable. I felt as if I was going to lose weight. Today morning all had gone to Centaur hotel for the meeting. It was at 9:30. Charu Ben and Ajay Bhai had come and 4 from our place. Still Meena Ben couldn’t make up her mind. They went to Matunga atraight from there and came back at 4:00 p.m. I went to college. Whole day went in copying notes. Today there was fair at our college. We all went there. Bhavna had also come and she met my friends for the first time. Even Rupa-gita had come. We didn’t have much fun. Though it was without a bit of trouble. Today morning I had gone to Kora Kendra to get plants and the mali(gardener) there didn’t give proper answers to me and talked quite nicely to other three girs there. I got damn bugged. Though even I was talking in mixed up language to him and wasn’t talking smartly. I went to Bhavna’s place to study. Bhavna went to college but I studied there. It was damn peaceful and fun. I like everybody in her place. All are good. In the morning I put mud in the plants and changed 1-2 pots of plants, I like doing gardening. I treasure the hours I spend for watering them. Then Bhavna had come and we studied a bit. In the evening we had gone to the market for buying vegetables and then we had gone to Minu’s and Sapna’s place. It was nice. Today was our college day. Full day I couldn’t do anything useful except thinking about how to get ready and all. I washed my hair and Meena Ben dried it and straightened it for me. She was sporty about it. I wore raw-silk churidar an it looked good. I had taken a pony. I had done make-up and in the college it was good to be with friends after so many days. But I somehow felt alone and wanted a friend. Yeah, a boyfriend. I felt dumb sitting there and seeing others doing all kinds of activities. While I sit here doing all kinds of calculations about life. I don’t know exactly what I’m missing. So, its better to do your best and do all you can do. Go about, meet people and live, yes really live. I attracted many glances but that does no good. I should be the best of girls and wait patiently. I’m sure the Prince will come if I become a Princess. There are many other activities which will make me happy as well as busy. So, cheer up baby. Tried to study but couldn’t. There was match on tv. We lost to England. On Monday on Makar Sankranti day Bhavna had gone with Rajul to Amrapali and she told me something else that she had gone all alone. I felt damn bugged. Why should she tell me a lie. I even went to the extent of thinking of breaking our friendship. Whenever I sat to study, I always thought of that. I had gone out with her in the evening and she must have smelled something amiss that I knew. She confessed. I felt happy about it the whole day. She told me striking news. That Rajul and Sameer were going steady. She said that I must have sensed it. But I never had a single doubt. Rajul had even gone to Shirdi with Sameer’s family telling all that she had gone with her friend. Bhavna said that on Makar Sankranti day they had gone to Sameer’s place. I was dumb not to have sensed it. I had gone to college and worn Meeta Ben’s top and it looked good. In the evening all had gone to Manoj’s engagement and I went to Bhavna’s place. Bunty didn’t allow us to come back at night. I had slept at Bhavna’s place. We studied till late. At night I was frightened as it was the first time I had gone there after her grandfather’s death. In the morning we went to play Badmington and there Bunty got angry and started beating and said no playing. I got damn bugged. He has become very Jiddy nowadays and beats everybody. He is good also at times. Full day I was reading the book ‘The Ring’. I just couldn’t stop. It is by Danielle Steele about Germany at the time of second World war. Hitler’s Germany. It is much crying type as all of her books are but I enjoy reading them. There was a one day match and agin we lost to England though we fought back nicely. England’s fielding and sportsmanship is good. On college day ami gave me address of a pen pal. On Thursday my spirits brightened at thinking of it. I must not be so hopeful. I did a bit research on Germany. I’ll write the letter tomorrow. I couldn’t stop reading the book’Ring’. I wrote first letter to Luitgard. I hope she writes back. I took full morning to write it. I have a rough of it with me. In the afternoon I went to Bhavna’s place. But Bunty was there and we couldn’t do any studying. I felt bored with Bunty’s dadagiri. We made a big rope and threw a basket tied to it in the well. It was fun. We had gone to Ram Mandir. Nobody prays seriously there. I at last finished the book. I’m sureI’ll miss it now. It was so good and I’ll miss all the characters especially Ariana. It is good to have something that you really enjoy and like. In the afternoon, Malti Ben and Tiku Ben had come. It was fun to have them but I am always somewhat far away from them. And Meeta Ben always makes some excuses when she has to come alone with me to Dehrasar. She always goes with anybody else. I always get bugged about that. And I fervently missed college. I enjoy so much there. I like everyone there though I like everyone here also. But I’m always happy there. Today I hd washed my hair and I went with Bhavna in the morning first to rajul’s place and then to Post Office for posting the Germany letter. Then we had gone to the temple. I had taken a pony and felt very uncomfortable. Today at least I could study something. I put on the tape recorder and studied in the evening in the last room. I could at leadt keep my mind on studying otherwise I sit to study and all kinds of stupid and unprofitable thoughts come to my mind and I feel sad. I go on thinking about all kinds of insults and all such things which are far away when I’m busy. I tried to study French. Then in the evening Bhavna, Rajul and myself we waxed Bhavna’a legs and hands making her hands sticky with the ready made strips. I slept at her place. Morning we went to play Badmington and I studied S.P. Bhavna had come to my place as all had gone out. Started studying OC for Monday’s exams. In the evening I went to B-wing terrace to see the plants in Yash’s terrace. They have gone to stay somewhere else and the plants are dying. I asked Malay to climb there and putwater but he refused. Then Bhavna, Bhumpi, Manisha, Bunty and myself, we went to the fair, to take snap and then after some work t o Dwarka. It was fun. Bhumpi had left her hair and all were looking at her. I slept at Bhavna’s place and Bhumpi and me, we studied till 2:00 a.m. I went to Picnic to Mud Island. I dhouldn’t have gone because of my Preliums tomorrow but all were going and I felt like going and after all Preliums are Preliums. I enjoyed there. Yashwant Mama’s family, we four, Kanu Mama’s 3, Malati Ben-Dilip Kumar and 2 from their family, Pankaj Bhai, Pragna Ben, Tiku Ben, and Nalini bhabhi and Pravin Bhai. We went int the water till our necks. It was fun. We returned at 8:45 p.m. and after we had our bath we looked like beetroots especially Meena Ben. I got up at 7:00 and started studying. My head pained. I wanted to wear my new churidar but it was too loose and I got ready fast and went to the station. I felt awkward with Rupa-Gita at the start but then it was fine. The paper was damn hard but I’ll pass. In the evening Tina had come and we talked and I couldn’t study anything. After she went I had the feeling that I had a complex and everything I did was wrong. It must be because I was tired. I had the after effects of yesterday night’s thoughts. I am more confident now. The eco paper was not good and then I went to Malay’s school for Parents Day. It was boring. Bhavna had also come. We had English paper. It was good, as usual. I met Meeta Ben on the train while coming. We had SP. I knew nothing in the morning. But the paper was superb. I had gone with Rupa’s group to Rasraj. It was OK. I studied and in the evening went with Bhavna to Goyal and all. Today full day I felt bored. I read Reader’s Digest (foreign copy) and it was real fun. In the evening we had gone out to Sundaram and we met Thakur on the way. He asked us to take Varsha Ben with us and we three sisters, Varsha Ben and Tinu went and enjoyed. Though I felt a tinge of complex with Thakur. I was not at best of mind. I cracked all silly jokes. In the morning I felt that I didn’t know anything in BK and during the paper, I really didn’t know anything. I felt bored to write the paper. Then exams were over at last. Six of us went to see ‘Lava’ at Gaiety. It was OK. My head pained when it was over. Then we came to santacruz and had icecream and I saw their school ‘Rosa Manners’. Aparna showed me all their places where they stood during school. I came home at 7:45. Mota Bhabhi, her Ba and Ba had come to stay at our house. We were to go to Agashi with all elders, Meena Ben and I. But Meena Ben got her periods and I didn’t want to go alone. In the morning I did all work I wanted to do. I liked working today. I felt good and did all my heart’s longings which I couldn’t take care during my studies. I’ll not study until 11th and then I’ll study hard. In the evening I had gone to Bhavna’s place but she wasn’t there. I waited and then came home with Bunty. Bhavna was at my house. I had my periods in the afternoon. In the evening I was reading story book, Perry Mason when Bhavna’s phone came and we went to market and library and tailor. It was fun. Today in the morning, Manisha had come to give our clothes. She takes clothes and gives sometimes without washing and without ironing. Meena Ben, Mummy and I got damn bugged and I just asked her whether she had ironed Bhavna’s midi as it didn’t look like it and then in the evening her mummy said that she had ironed it and asked me what I had to do whether it was ironed or not. I felt damn bad. I washed my hairs in the morning. I washed some clothes today. First time I washed new clothes all alone. Bhavna had come to see ‘Kalicharan’. I went to college. I felt damn bored. I attended only one lecture and that also I didn’t do anything. I bought Nisha’s book to copy notes. I saw Biren today. After college I came straight to Avanti. I met Dipa first and she was fun. She went on calling me ‘Neelan. Neelam’ Jawani’s heroine. I was flattered. I felt very much left out at Meena Kaki’s place. We went to see Pankaj Udhas’s programme at Kalu’s ex-school and it was fun all the way. Pankaj Udhas was just gorgeous, so cute when he said ‘Shukriya’. Just seeing him and listening to him gave me a new hope of living. Jaya Bachhan and Raj Babbar had come. The crowd was dashing. I enjoyed with all of Kalu’s friends. It was fun. I came back home at about 10:30 a.m. with Deepa. She was going on telling me to stay at her place, then I asked her to come here and she came. She is lively and fun. In the afternoon we made a list of western and Indian songs for recording. I slept then and in the evening went with Bhavna to market. I was thinking that since last days I’ve felt bored and have done nothing useful. Just wasted my time in looking good which however will be useless and it has landed me into many bad books. I’ve decided to henceforth never feel bored and always be doing something you like. Never do anything you don’t like and is not right. I’m going to study hard for exams, then go for vacation toBangalore and then to typing and shorthand classes, study computer and management studies. But the trouble is I always forget all I want to do. I’ll remember this. And the best way is to do your best at all junctions of life and never give up and live and learn as you go on. Living is never so bad that you can’t go further. Just have patience and faith. Exactly one month left for exams. I made a time table. There are only 5 days for each subject. Bhavna went to Poona today. Today I studied from morning till afternoon and then had a hair bath. I left my hair open to Mita Ben’s grand modeling show at Patkar. It was fun. All were looking good. My hair was a sensation. What a difference it made to leave your hair open. It attracted many people. Ajay Bhai, his friend Nemi, Babita, Kalu, Dipa, Priti, Gita all had come. It was fun. Though I was not in the best of moods. I felt conscious. I went to college today to get the seat numbers and all. I had worn Stonewash pant and a loose mod shirt. It looked hep and I could feel it. It was fun and I enjoyed all the glances I got. Though in Borivli, I felt damn conscious. Today Lal sadlawala Bhabhu died. Today only Jayshree’s and Suresh’s marriage was also there. They made it simple. Today there was Expert(Accounting class) day. I couldn’t go because of Bhabhu’s death. In the morning again I went to college to get my hall ticket. I didn’t have a snap so I cut the snap out of old one and gave it to them. I had worn new ‘grey’ midi Meeta Ben had made and everybody just loved the midi. It was fun. I couldn’t study much afterwards. I read Perry Mason’s book, finished it, studied for little while in terrace, went to temple with Meena Ben. I had worn two different type of chappals by mistake. I went to Kandivli, to Manisha’s doctor. Today was Aparna’s birthday. I rang her up to wish her. I tried to study the whole day. I went to Aparna’s birthday party. I didn’t know what to give her and they all had a big laugh at home deciding what to give. It was fun at her place. Her school friends are big fun though I was a dummy at times, I enjoyed it. Her nephews were also good. Her building friends told me that I was sweet when I came out. Today was Raju Bhai’s marriage. I looked good at both times. There was a good crowd. It was fun. Kalu drove the car in Avanti. Ajay Bhai was great fun. I had worn Chaniya Choli in the evening. Bhavna had come from Pune on Saturday and in the evening I went with Manisha to her place. I met her Sanat Bhai Saab there. Jasmine Bhabhi came today at home. I was acting without thinking at times and she said so openly. Dhrashti was damn fun. I got a letter from Luitgard. I was very, very happy. She is 6-4’ height. Everybody read the letter. Today I got another letter from Ahmet of Turkey. I was damn happy. He is 20 years old and 78 kilos and 6 feet tall. Today was Bhumpi’s farewell day and she was looking a heroine. I bought a puzzle game from Bhavna’s place. Ba and Mami had come to stay as there is a big Mahotsav and Diksha and Mal’s in Borivli. I couldn’t study anything. In the evening I was busy doing Bhavna’s puzzle. It was damn fun and hard. Today in the morning at 5:00 we went to Yogi Nagar to start the new Dehrasar there at our flat. Daddy had given the flat of about 1 lakh rupees. He even put the flag on the Dehrasar. It was damn big business and we were among the chief ones and everybody was doing Jaisukh Bhai, Jaisukh Bhai. Then there was Diksha of four at our side and we went there and saw four girls lead for Diksha. It was touching. Our exams had started today. I felt damn stupid after so many days of sitting home and then going to college to give exams. My center is MK. Exams are over. Today I had two papers. In French paper, there were only 6 students giving the exam and I felt damn bored. Shital had come to leave me and afterwards to take me also. Bhavna went to Dubai today. I went to pay my fees for computer classes. Nisha and her sister Mita also joined it. I went on my first day of the classes. Anita and Lilac has also joined it. I was feeling down in my dumps today. And after many days I’ve opened my diary. I feel damn low nowadays. I know I can be damn smart and intelligent when I want to be and I think and do everything I do with my mind. But I’m very impatient and lose my mind and do everything wrong at times. And for that I suffer and make others suffer. I liked a boy in Dwarkesh. I used to look at him when he passed. I didn’t think then of the consequences. I know it was my fault. It is not good for grown up girls to stare at boys. But I did and somehow even he looks now and I blame myself for doing it. It was my fault. I’ll have to face it and take care in the future. Even in the classes there are 2-3 boys. One boy smiled at me once and I smiled back and now I feel as if he’s making a pass. I feel damn guilty and I somehow punish myself and then everything goes wrong. Should I be selfish and just go on living happily or what else? I think I should live intelligently at all aspects of life and don’t give up as it’ll just worsen matters. Face all difficulties and consequences with smartness. My Birthday. It started only as a big disaster. I had my periods in the morning. Then I had washed my hair straight with conditioner and they were damn oily. I was to get my papers today and I got good marks. Wher I expected to fail I got 60-50 marks. Then it was raining damn heavily the whole day. Nisha, Aparna, Hemal, Rupa, Gita had come to my place. It was okay. I was not in my best of moods and very excited. We were to get our results today. But we never expected the long queue for it. We had big plans to go to Open House after the result. But we left only at 12:30. I got 68%. I’m quite satisfied. Bhavna got 59%, Rajul 58%, Nisha 61%, Aparna 64%, Jayshree 77%, Hemal 75%, Ami 71%, Rupa 65% and Geeta 74%. We all were satisfied. I had gone to Bhavna’s place in the evening and she showed me all her shoppings. She has brought a Video and many nice dresses. I had put oil today in my hair and was at home all day. Didn’t go with Bhavna and all to Sai Baba Mandir also because of the oil. I felt damn bugged with myself. I’m putting beauty before everything else. That is bad. I better improve. In the evening we were searching for Malay’s new bag and old umbrellas. They seem to have disappeared. Today I danced for the first time. We had a party at the computer classes. It was fun. In the morning we had classes. I had worn my pants and the Wrangler shirt, my birthday gift and I felt damn hep. Then we had gone to Nisha’s place and then back to college to pay my fees. Then I went home came back again at 5:30 and enjoyed and then went to sleep at Nisha’s place and came back today morning. The party was damn fun. I didn’t know how to dance. In the starting only, Anil asked me to dance with him. I tried to and succeeded quite a lot but I felt damn funny and silly. Then I danced with many other boys and it was fun. I danced quite a lot and my hair was a mess. Anil was surprised that I had not gone to any social before. Even he is in our college and same standard. I had never seen him. Even he had not seen me. I enjoyed at Nisha’s place also. Today from afternoon it started raining cats and dogs. It just poured terribly. In the afternoon we had gone to hear Maharaj Sahib’s Vyakhan. I enjoyed it. He said that one should never get angry at anyone. And he made us promise to pay Rs. 10/- if we lot our temper even once in 24 hours. Meeta Ben nevr lost once. We could see the effect of it in everybody after the Vyakhyan(speech). Everybody was in good moods. He also said that it is not bad to have enemies. Everybody has enemies. But it is bad to have enmity coming from us towards other. He also said that it is very hard to cheat a nice and good person. He asked us not to pur money in front of all other values. I was really touched. I try not ot lose temper. It is easy once you try. I always used to feel damn sshameful once I lost my temper. Tina had a son today. We had gone to see her in the night. She had done a Caesaerean and she was somewhat unconscious. Bhumpi got her result today. She got 70%. She expected more. She wanted to go to NM where they are asking 80%. Bhavna, Rajul and I had gone to get the result from school. Today there was a lecture of the principal Rai and I had gone to college with Rupa, Gita. I acted very silly and stupid. I had gone to Geeta’s place afterwards and had lunch there. Then in the evening I had gone to Bhumpi’s friend Poonam’s place. I enjoyed there. I liked her. I had classes in the morning of 4 hours. Nisha had got angry as we didn’t go to Juhu Beach on Recess and she was hungry. Today I had worn pants to college. My pony was looking bad. I felt as if I looked damn bad. In the evening I had gone to Rupa’s place to see her with Bhumpi as she had done Jaya Parvati and her Jagaran (not sleeping whole night) was there. We stayed at her place overnight, I and Gita. Her brothers friend rajesh had come there and he used to see me while going to computer classes and he said that I looked cute and made passes. I felt bugged though it was flattering. Rupa and Gita were back answering but he didn’t go, we were awake till about 4:00 a.m. We got up at 6:00 in the morning and got ready and went to college and temple. We were all feeling bored and tired but I had to go to take my System Analysis book from Anil. Kushala told me that in their class they teased Anil with some girl. I was tired when I came home and slept till four. Then just now I took bath after putting oil. Luitgard send her snap. She looks damn good. We had our System Analysis exam. We were only 10-15 students in one class and I mostly copied everything. The professor had not come and the peon was supervising. In the evening we went for a long walk. Masa, Masi, Mahendra Bhai, Varsha Bhabhi, Meeta Ben, Guddi, Manisha and myself. It was fun. Then we went to Datta to have dinner. Our Rikshawala was damn fun. He said that people go to college for fashion only and that Malay was good and there was fashion show in Mithibai and Bhavans was not good. Today was Hemal’s birthday. I had gone to college, came back home and then went to her place again. I enjoyed at her place. She hads nice building friends. It was damn late by the time we finished and Meeta(Nisha’s sister) asked me to stay at her place. I rang up Daddy. And Daddy got damn angry. Today I received Ahmad’s (Pakistan pen friend) musical birthday card. It sings the tune of ‘Happy Birthday’. It went on & on and nobody knew how to stop it. I went to college from Nisha’s place. I had worn Nisha’s dress. The musical card was with me and I fekt damn frightened at times about it. I was afraid that all will sout at me when I go home but nobody said anything. I was very tired the whole day. Malay and Minar got their first pen friend address today. Malay’s is from Italy and Minar’s USA. I went for a hair cut from college. I wanted to cut it in shape and everybody got wild because I hadn’t asked anybody at home. At night I put Mehndi to Neha, her mummy and Kailash ben as Ashk Bhai’s wedding is on Sunday. I went to college at 9:30. I wasn’t looking good and I felt damn awkward and damn shameful because of it afterwards. Nowadays many times I feel awkward. Must be because of my new hair style. Today I had gone to college from 1st lecture only. And Smruit was ina damn good mood and we were laughing all the time. Then after class Anil asked me if I was free on Saturday and whether I would like to go for Social with him. I was taken by surprise. I told him I would tell him tomorrow and now I’m in a big dilemma whether to go or not. Then when I was coming back from the platform, a guy who was recently introduced to Rupa asked me whether I would be friends with him. It was so stupid. I didn’t know what to answer. He somehow took it that I would and went away and when I came home, I received a letter from Turkey pen-friend. All was damn good. Bhavna had also come home. I told Anil I couldn’t come as I hardly go for socials. He took it in damn good spirits. I wore Dipa’s rad shirt and stonewash skirt to college today. It looked damn good. We had blood donation today and Nisha, Hemal were busy with it. While I was coming home from college, all alone in the train I felt damn giddy and I felt as if all around was going round and then I found everyone waking me. I had fallen down unconscious. It was embarrassing though I felt like laughing afterwards. I had many college friends in the train. My legs were paining and when I reached home I found out that I had my periods. I didn’t go to college today. Daddy didn’t allow me. In the evening I had gone to Bhavna’s place. Saigita’s cousin had come with Bhavna and then Samir, Gita, and her Mami had cometo take him. Samir was fun but he was talking damn stupid at times and I fekt damn awkward because of that and therefore acted awkward. I should have ben more tactful. We had gone to Powai today. It was damn fun. I didn’t take bath but I enjoyed. I was in a good mood. Bhavna had her periods and I went to her place to cook. It was damn fun. I cam learn cooking at her place. Anil is not feeling well. Parul told me that he had typhoid. I asked Jasbeer how he was feeling. He said that he had fever and that he was OK. He doesn’t come to college since many days. I had worn my yellow churidar today. And in college, Ashok told me I was looking very beautiful today. I told him ‘Thanks’ that time but then I felt damn bad. I had told him once that I could only tell him ‘Hi’ and ‘Bye’. But then after some days he’s asking me why only ‘Hi’ and ‘Bye’ and so he only talks whenever we meet at times. He asks questions and I say ‘Yes’ or ‘No’ or some short answer. And now this. I don’t know what to do. All say that just ignore him. But he’s such a Chitku. I can only hope that all ends well. Today there was a debate in college about ‘Should students teach professors how to teach’. It was students v/s Professors. It was damn fun watching. The teachers won by 9-2. Miss Rai hoped that we would win next time. Today there was a movie ‘Junglee’ on TV. It was fun watching it. The songs were damn good. Today was a busy day. In the morning I went to college. I had washed my hairs and had left them as I went to college. It looked good but I took a pony afterward. We all college girls were to go to see ‘Saagar’ at Pinky. The movie was good but some of our class guys were damn stupid. I felt damn bugged at them. Ami talks to them and when I asked her why she said she was in a fix and couldn’t help but talk. In the evening Meena Ben, Pappa, Ketan hai, Jasmine Bhabhi, Dhrashti and myself went to see Kaka. It was not fun but OK. Kaka was good. Jasmine’s baby Shahzan looked good. 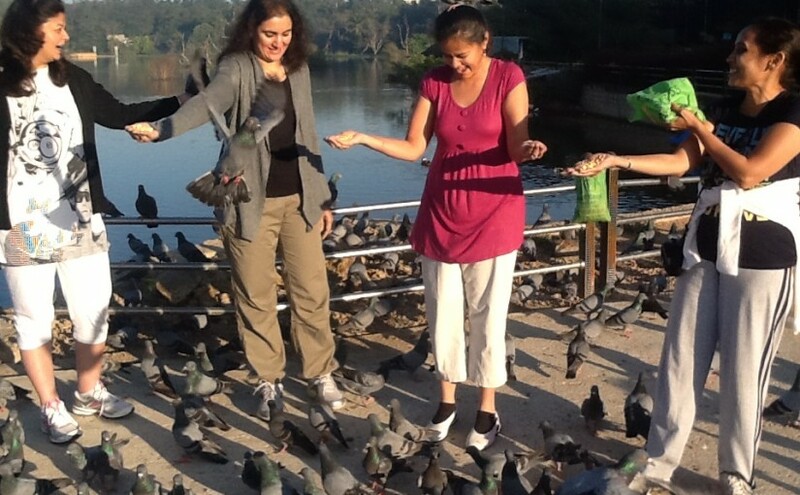 In the evening I had gone with bhavna to damietta’s place and then to temple and then Gora Gandhi. It was fun. Today there was holiday in college because of Independence Day and I had gone to temple with Meena Ben and I asked God to make Anil better (he hasn’t been coming since 2 weeks) and just on thought I said that if Anil came tomorrow to college tomorrow I would believe that he was fit for me. In the evening I went to Matunga with Malay and Daddy. It was fun. I had decided to act wisely and it wirked wonders. We saw a flat in ‘Usha Darshan’. Then we had gone to eat Pav Bhaji and I fekt somewhat shy and that was bad otherwise all was good. In college I didn’t see Anil and I felt mad at myself for having such stupid notions but after lectures when I came down all Rupa-Geeta’s friends said that they had seen Anil and I was just stunned. In the evening Rupa-Geeta had come home and I went with them to Goyal and then to Goragandhi. Bhumpi also joined us. Then we went to Sapna-Minu’s place. Sapna is going to Amravati for her medical college and we all went to Bhavna’s place and chatted. It was fun. I went to St. Zavier’s college to see ‘MALHAR’ with Hemal, Priti and Heena. It was fun though we didn’t get entry for most of the programme because of the crowd. The crowd was good. All were looking smart. We were damn tired at about 12:00 to 12:30. we had something at ‘Suruchi’ and came home. On the train I met Althea from school and she said that I was completely changed from school time. Bhavna had come in the evening. Ajay Bhai-Kalu came at night and Ajay Bhai fooled with Bhavna-Rajul on phone. Today I had gone early to college. I saw Anil – from college window. He was standing down. He is smart. At 11:00 we went to see duet competition. I was left behind and I had to sit all alone and right on the 3rd bench. I felt damn bad at first but then I enjoyed looking at the singers and especially the musicians. It was fun. Today Anil didn’t even look at me. Nowadays I do feel somewhat inferior. I don’t have confidence. I’m not going to give him any bhav. I had gone straight to Avanti from college. It was fun at Avanti. At Avni’s place we ironed all churidars for Kalu’s exhibition. Avni’s mummy is big mouthed and taunted everybody. I had gone to Meena Kaki’s place and then Kishore and Bharat Kumar had come and all of us went to Guru Kripa. Bharat Kumar was good and we enjoyed. Tody was the grand exhibition. We arranged all churidars in the garage and once the rope broke and half of the churidars fell down. It was good. Mostly all relatives and buildingwalas came to see it. In the evening we went to Megh Mahal and I found Jasmine Bhabhi not liking to be with me. I felt bugged at first but then I thought that damn everybody. Why should I be bothered about what she likes. Let her do what she wants and I should do what I want. After all, world is not full of Jasmine bhabhi’s, but there are people like Ajay Bhai, Bhavna, Meeta Ben, Bhavin, and their likes. It was an Id’s holiday. I didn’t go to college today as I had put oil and I got my periods today. Sameer won the elections of D.R. Today was the elections of DR . Roopali had stood and I voted for her. But some Bhavesh won. Anil hadn’t told me ‘Hi’ since last Thursday and today he told me ‘Hi’. I don’t know what to make of it. Bhumpi had gone out to roam out with Rajesh and his friends and she said to Guddi that she’s going with college friends. She met with some accident while coming back. In the evening Bhavna, Kaka and myself had gone for a long walk to Yogi Nagar and LIC. Today was Raksha Bandhan. I tied Rakhi only to Malay. I missed Bunty very much and I felt bad for not sending him a Rakhi. Babita had come in the evening and I had gone with Bhumpi to Joshna’s place. Joshna was good. I like her. We had lunch at Mami’s place. I enjoy at Premila Mami’s place. I went to college all alone today and came back with Rupa-Gita, but they went in Gents compartment with Batuk. In the evening we went to see ‘Ram Teri Ganga maili’ with Lata Masi and Mahendra Bhai and Varsha Bhabhi and all. It was a very nice movie with nice songs. Today in the morning was just the same, watching tv. It was Minar’s birthday and in the evening we ate the cake and had icecream. Then our house and Kailash Ben’s house we went to Juhu Beach and then to woodlands. I had left my hair. Bhavna had also come. Our exams are on 28th and I haven’t started studying yet. I’ll have to start now. We had gone to Cooper Hospital for N.S.S. (social service) in the female ward. It was sickening. We were asked to talk with everybody. Some of them were suffering badly. A lady was crying as she had urinated and there were very thin ladies. I couldn’t talk freely and I felt bugged. There were one-two girls who were damn fun. Nowadays I feel very insecure. I don’t know what to make of Anil business and I want to be that happy and carefree girl that I once was. Today was Lilac’s birthday and Nisha and nyself, we went to the Khokha market and bought earrings and necklace for her. Then after college we went to her place. I was in good mood and it was fun. I wanted to enjoy and I enjoyed. Not quiet enjoyed but I didn’t feel sad or depressed. I came home, put oil and slept till 7:00 p.m. I tried to study. Sameer, Mama’s youngest son had come in the evening and I gave him tuitions. It was fun. Lastly I’ve been trying to do my best in everything and it works damn good. I get frightened that I’ll lose the confidence. But I’ll try my best as it’ll be me only who’ll have to face my troubles. I hardly studied anything. In the evening Bhavna, Kavita and myself we went to Goragandhi. Bhavna was telling about her own problems at home. They had gone to dandia Raas yesterday at N.L. school and came lat and Jiji got bugged. I slept at her place to study but we hardly studied anything. I had gone to college early with Rupa. In the last lecture, Anil had come to meet Jasbeer and I talked to him. Ami said that it was damn obvious that I was running after him. I felt disturbed by her words. Nisha and myself, we gave treat to others for passing our computer exams. Christine had also come and it was fun. Nowadays Christine, Aparna, Smruti and myself we have nice fun. Today we had tie day in college. Mostly many had worn ties and all looked smart. I had worn Rupa’s daddy’s tie, daddy’s shirt and our black skirt. It looked good but when I came back I was somewhat too proud or too tired with ways of llife and thought I looked too good only to discover that I looked very bad when I came home. Couldn’t study much in the evening. We had gone to a picnic to Lonavla. Yesterday night I had stayed at Nisha’s place and today also Paresh and J.D. and their group had come. They are a lot of fun. But they thought of themselves as superior and left us. I felt damn bad butthen it was fun afterwards with Hemanshu and Hardik and our group and all. Nowadays we do Diwali works and it keps us busy. Some of the people who had seen Meena Ben were said to be coming to our place and then we came to know that they weren’t. I feel very bad for her. All this weakens her confidence. She was such a proud girl first. Though she still keeps herself high it somehow effects her. Sometimes I feel damn bugged with all this. We had gone to Meeta Ben’s college to see the exhibition held there. It was fun. I had left my hair and tied a clip. It looked good. I felt good also. I’m looking forward for a career. I don’t know what would suit me. I feel like doing all courses. I’m thinking of doing beautician course after college. At present I want to write a story. I’m thinking of a favorable topic. Today in the evening daddy had rung up at Hansa Masi’s place. Anju Ben has come and she asked about Malay and Meeta Ben and Meena Ben and not about me. But I shouldn’t have worried as it was, she is very cute thing. I’m only lazy. I don’t want to care for people and I expet them to care for them. I at times don’t even try hard to do my best. Today was New Year’s day. I got up in good spirits but somehow something went wrong and I ended up with a bad mood and a bad face. Evening was good. I couldn’t make up my mind whether to go to Matheran tomorrow. I went. In car, I sat with Praful bhai, Malay, Minar. I felt bugged with Kailash Ben for making me do it. But I consoled myself that I would be happy once I reach there as Aparna would be there and then everything went about fine. I quite enjoyed there. In the evening when we went out there to roam, I could feel everybody looking at me. A good feeling. Meeta Ben, Dipa and Guddi came with Bhabhi-Daddy and it was fun. We played a lot in the afternoon. We made friends with Jinal. Her phone number is 624698. I had gone with Manisha-Minar-Malay horseriding and the public were damn stupid. I heard somebody calling me ‘Neelam’ and other group flashed their camera at me. I fekt damn bugged at the time. Our nieghbours at the hotel were five boys of whom one was Deepak. One of them Girish send a card to Guddi telling her his phone number and all. Guddi tore the card. It seems one of them were after me also. We left to come to Bombay. We enjoyed in the train. But while coming back by Metador again Kailash Ben asked me to go by car and I rudely said ‘No’ and afterwards I sat crying quietly in the front seat. It was damn bad ending. I got my result. And the shocking news were that I failed in 3 subjects. I felt damn bad. I told Anil that I had failed in 3 subjects and he was very shocked. He passed in all. I saw the movie ‘Bombay Ka Babu’. It was good. Songs were superb. I got my periods. I didn’t go to college. Whole day was spent reading book and writing letters to pen friends. Today was our lollipop day. I expected some but I went prepared, if I didn’t get any. I received two. One from a T.Y. boy. As there was Tina’s birthday tomorrow she took us to Wai Kiki. Today was Meena Ben’s birthday. She went to see a boy today. Daddy came from Delhi today. Today was Meeta’s birthday. I took a card for her. She called me at her place but I didn’t go. Daxa faiba, Kirti Fuva, and all had come and they stayed for the whole day. We had gone to National Park anf then to Neelam. Neelam had pened a Yankee doodle shop and they were giving free ice creams. We enjoyed there. Today Vincent told me that the boy who sent me the lollipop was psetering him to introduce me. I asked him to show who he was. Vincent introduced me to Manoj. I expected someone chalu. But he looked decent. I didn’t know what to tell him and said Thanks for the lollipop which I repented afterwards. After his stupid wordings I shouldn’t have done it. But the mistake was done and I was left to repent it and pay for it. I’d better watch my steps in the future. Today was Parul’s birthday. I didn’t go to her place. I gave her a card. Today I went to have lunch at Bhavna’s place as nobody was there at home and then I put oil. I had worn pants(jeans) and new top and it looked good. But I was in bad mood while coming home from college. Today we had one lecture in college. I was just roaming about in college. I talked to Anil and he took an interview of me. I felt somewhat bored with it. Half of my answers were vague. I felt bad about it afterwards. Jigar’s birthday was today. They took a video tape about it and then we had gone to Neelam. I went with Raji to see the movie ‘Sahara’. Brooke Shields looked damn good. I had worn Kalu’s pants and red Dipa’s shirt. It looked good. We had gone to Akashwani and then to a shop to have coffee and milk shake and then we came home in Raji’s car. It was damn fun. I always enjoy in town. Bhavna’s mummy came today with her Daddy and Bunty from Muscat. Bunty looks real good and fat. I had my periods in the evening. Good. As we are going for Jatra on the 25th. In the morning at 7:00 we started by bus, a TCI one. Our family, Lata Masi’s family, Praful Bhai’s family, Nanu Kaka and Hansa Masi. I vomited in the bus. Manisha, Lata Masi and Hansa Masi all were feeling sick. Whole day was spent on traveling. We reached Ahmedabad at 12:30 at night and all were tired. We left Mama’s place (Kailash Ben’s) with Masi and Dimple and went to Kalakund. Ate there then went to Songadh. In the evening we went to the temple there. It was a Kanji Swami temple and it was peaceful and quiet there. We went to Palitana. I was very tired while climbing down. I didn’t do any Pooja but just prayed. The main God is Adeshwar Bhagwan the one whom I had prayed that day about Anil. We came down and drank Limbu Sharbat and had bhel, my favourite. And then we had gone to Bapji’s place. It was very tiring day. We came back to Songadh. Anil Bhai anf Bharat Bhai had come to Songadh and we all got ready and went to Bhavnagar. We went to Balvatika first and then to our house. We met everybody. I enjoyed at the medical shop. In the evening we went to Gandhi Smruti and Takhteshwar. The latter was damn nice place. Keyur got hurt on his fingers. Today Mummy and Kailash Ben did yatra to Palitana as they couldn’t do before. We went to Hastgiri. It is nice place with plenty of wind. But the temples have not been finished yet. We did some shopping at Palitana and left Songadh in the evening. We reached Vijapur at 12:30 at night. We got a single hall and all 18 of us slept in it. Our driver was also real cute and he wanted to buy sari for his wife and Meeta Ben helped him. We had our bath in Vijapur and from there we (Nanu Kaka, Hansa Masi and Meena Ben) went to Palanpur in a jeep to meet Tina. Chintu has become damn cute. It was fun there. We came back by car as it would have been damn cool by jeep. When we reached Ahmedabad everybody was waiting for us. We went to Love Gardens at night to do some shopping. Dimple and his brother were fun. I came back by scooter in the cold breezy night. Whole day went traveling. Morning everybody got ready soon (Masi had given us nighties to wear and she had send two nighties. I was thinking of taking the nice nightie and giving the shiny one when Masi came and took nice one and gave it to Meeta Ben. As if I deserved the bad one. This gesture burnt my mind and when we slept, I wept furiously so that I couldn’t sleep also. Then I calmed down and slept) Morning I was back to my own self smiling at Masi. We reached Bombay at night. It was good to be home.